The bootup went totally fine, and fast, not as fast as the hype said they are, but definitely way faster than Fedora 14 bootup, thanks to Lennart Poettering's systemd!. Quite likely its some of the custom scripts I had in rc.local slow stuff down a bit. However for some reason NetworkManager got disabled from the startup, but fixing that is simple anyway. There was also some broken library dependencies left around, but most of them goes away after a yum update and some manual cleanup to get rid of old stuff from GNOME2 legacy. 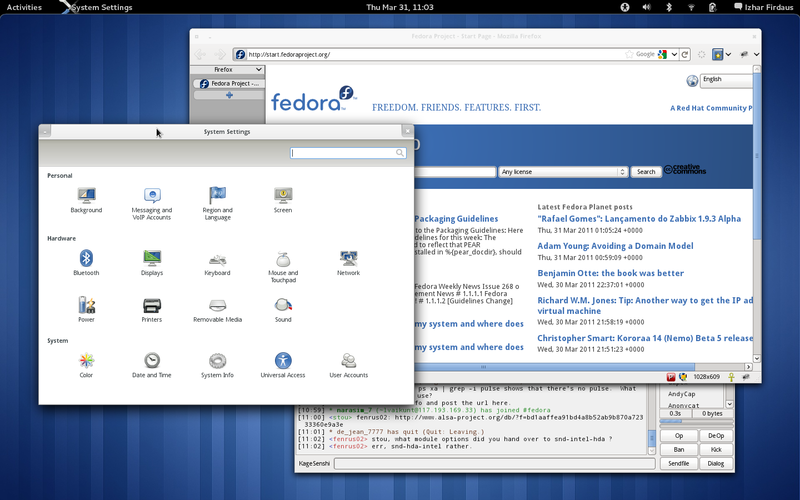 First login into the GNOME3 desktop, I was greeted by HUGE fonts. A bit too huge to my liking. The FAQ at Features/Gnome3 page pointed to the accessibility settings to change the fonts size, however, the 'small' setting is too small. Then I found out about Gnome Tweak Tool which allow more detailed customization of fonts, similar to what we had in GNOME2. So problem fixed, back to my Droid Sans/Droid Sans Monospace 8 settings. Another thing I found huge is the scrollbar on newer GTK3 apps. Old GTK2 apps still have the old styled scrollbar which have its width JustNice(r). The GTK3 window toolbars are huge too. The top-bottom padding is a bit too much, wasting precious vertical space. Anyway this doesnt bug me much, hopefully will be 'fixed' later when more GTK3 themes are introduced. Another weird stuff was the minimize and maximize button have gone missing. I'm not using them much anyway but it feels weird to have them missing when I need them. The tweak tool provides an option to enable them back, however, on a traditional layout (:minimize, maximize, close), but I'm one of those creatures who uses slightly different layout - 'maximize, minimize: close'. After some digging around, I found out that the setting can be customized at gconf /desktop/gnome/shell/windows/button_layout. Happy again :). 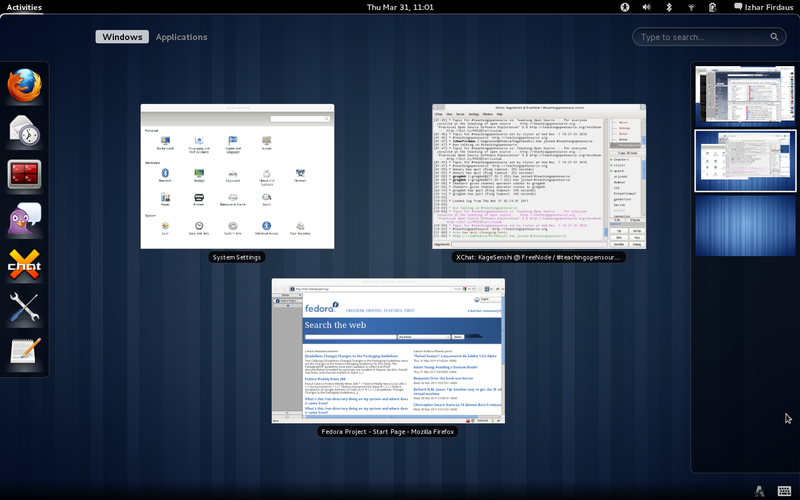 GNOME3 introduce lots of radical changes in the UI. Some of which might take quite a while to get used to. 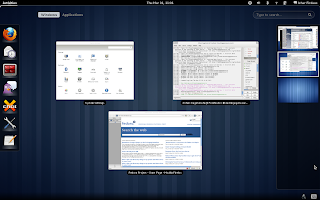 I was a GNOME-Do user back in GNOME2, using (Left) <Super>+Space to activate GNOME-Do. GNOME3 however hoard the super key for itself, causing all my super key related shortcut to be unusable. Still trying to kill the habit of punching <Super>+Space. Another thing that might take a while to get used to is the window management. For years (since Windows95) I have been using the taskbar to monitor window status and switch between them quickly. In GNOME3 however, there are no such thing. Switching between windows requires an extra step of going into the Activity screen and select a window. However, I still haven't see whats the equivalent of blinking taskbar button when a window need attention, which might make handling of tens of windows which might need attention once a while a bit tricky. Probably cairo-dock or similar might help in filling this gap the taskbar left behind, which I have yet to try. Besides those, everything else with GNOME3 are great, the activity screen is awesome, the desktop switcher is awesome, the launcher is awesome :D.
Due to the radical changes GNOME3 introduces, lots of stuff from GNOME2 is now deprecated. One of it is panel applet. I am one of those who always want to monitor my processor and memory usage just in case one of the stuff I run goes naughty, use them up and cause miserable slowdown. I monitor to kill them before they wreak havoc. Back in GNOME2 I used the GNOME System Monitor applet to monitor these. However, theres no such thing in GNOME3 yet. Guess I'll have to run htop somewhere, or find some other system monitor tool. Conky probably might work, but I haven't tried it yet. Another thing I missed is the 'outline resize' from Compiz or the 'reduced-resources' mode from metacity. Live resizing a window is a bit slow and annoying because of the frequent re-rendering process done during resizing. Outline resizing is faster because it only re-render after I released the mouse key, and with the right colors, outline resizing looks nicer than live resizing too. GNOME3 maximize-when-window-is-dragged-to-the-top / fill-half-of-screen-when-window-is-dragged-to-the-side (whatever that is called) uses outline to preview the resize, hopefully this will be possible in window resizing too for future releases. Fedora 15, even in late alpha state, feels quite stable, probably thanks to the early branching policy which branch out F15 from rawhide early to allow stuff to stabilize better. Good job and thanks to all who have made this possible. As for GNOME3, the changes are radical, so those who are very used to the workflow of GNOME2 or similar desktop might take quite a while to get used to it. If you couldn't get used to it, XFCE might feel more at home. There are some usability issues around which I noticed, mainly in regard of switching windows quickly and getting notified on which window need attention even after I've left the computer for a while, but I think that will be fixed in time. thx a lot for your interesting preview! > "However, I still haven't see whats the equivalent of blinking taskbar button when a window need attention, which might make handling of tens of windows which might need attention once a while a bit tricky." That's actually the point: focus on what you are oing and don't be disturbed by all those windows competing for your attention. I find it quite liberating and less tiring. Plus, windows that need your attention should send a notification anyway, which is handled in a non obtrusive way by Gnome-Shell and they get stacked so you don't have to be afraid of missing them. In case you didn't find it, try moving your mouse to the bottom-right corner of the screen. > "I am one of those who always want to monitor my processor and memory usage just in case one of the stuff I run goes naughty, use them up and cause miserable slowdown. I monitor to kill them before they wreak havoc." Those should really be fixed. There is no reason for an application to take so much CPU that it renders the machine unusable. > There are some usability issues around which I noticed, mainly in regard of switching windows quickly and getting notified on which window need attention even after I've left the computer for a while, but I think that will be fixed in time. Yep, I have exactly the same problem. The activity view rearranges the windows previews when a new window is opened. When you switch windows often (when I'm programming, I switch between Firefox, gvim and a console, for example), it's confusing when you open a new window and you need a couple of seconds to find which is the new arrangement of the previews. For me, this is an real PITA because it interrupts my workflow. Gnome 3 wants me to focus in one activity at time, but what happens when 'one activity' involves several applications? > "Gnome 3 wants me to focus in one activity at time, but what happens when 'one activity' involves several applications?" Then you just alt-tab or split your screen in half with edge tiling. Just like you, I rarely use the overview screen. Or rather, I'm finding that I have different patterns of use. When I'm simply doing stuff like any regular user on my computer (i.e browsing the web, reading emails, listening to music or watching a movie) then I will mostly use the mouse and almost not the keyboard (except for reading emails which can warrant some reply, the rest is pretty much "passive" activities). In these situations, I almost exclusively use the overview screen to switch and find it quite pleasant. When I'm working however (hacking with at least one browser window and a terminal, perhaps rhythmbox playing in the background,...) then I am almost exclusively using the keyboard to interact and switch. In these situations, the overview is nothing but a glorified launcher, I don't ever use its switching features but prefer alt-tabbing. I think that's the biggest feature of Gnome-Shell: power users can still be extremely efficient with a (almost) keyboard only workflow (just like in Gnome 2 really), but it finally became pleasant to be slacking at your computer, doing nothing productive, just with a mouse in hand. these things could be easely achieved if the launcher\taskbar, shown only in activities, was accessible in the normal workspace. > "Then you just alt-tab or split your screen in half with edge tiling." One of the main features with Gnome3 focused in a main app to be dont disturbed with other windows and notifications. Well, it fails. Its very confused actually. Yo need to do one or more clicks, point and click, alt tab and other things to see all your apps. Its very frustating. Sincerely, KDE is the winner. Linux at work so this is frustrating.